For the new 5R, we’ve pulled together premium features that used to be available only in much larger models. And packaged them into one incredibly agile tractor with the power to move mountains – and to give your business a boost towards greater productivity and more opportunity. John Deere guidance systems offer many benefits to the operator, including optimizing machine efficiency, reducing operator fatigue, and the ability to work at faster speeds. AutoTrac is an assisted automated steering system that automatically steers the machine through the field. AutoTrac is an automated steering system that can be operated from 0.5 km/h to 30 km/h (0.3 mph to 18.6 mph). Straight track: operate in absolutely straight lines by defining a point A at one end and a point B at the other end of the field. Skipping lines for easy and fast turns at the headland is possible. 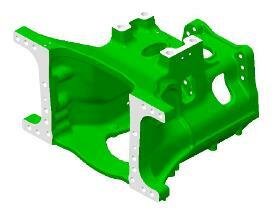 Curve track: the curve track functions are available on all AutoTrac tractor models. In particular, when driving the first passes at the headland, the system follows the shape of the fields curves, driving curves with a constant or increasing radius and using AutoTrac at the headland after completing the first row. Markers: when a tank is empty, for example, the system marks this point in the field. After having filled up the tank, the display will guide the operator to the location they marked. Turning view: on the headland, the operator must manually steer the tractor close to the next pass and then press the resume switch. There is no need to place the tractor exactly on top of the beginning of the next row. This means saving time on the headland. Shift track: this function allows the operator to return to the field to finish work they started yesterday. Satellites move the whole time the operator is away and so the guidance line is not at the place from yesterday. The operator can press one of the shift track buttons to fix the line for for the day’s work. 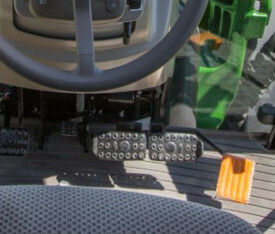 The tractor controllers process differential global positioning system signals from the StarFire™ receiver, the wheel angle sensor, and a steering wheel position sensor. It uses these signals to steer the tractor via the electrohydraulic steering valve. The steering wheel position sensor detects slight motion of the steering wheel. 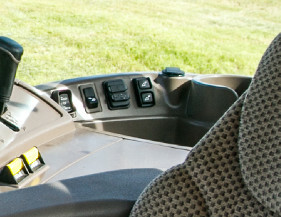 If the operator performs manual steering or leaves the seat, the system is shut off. To activate AutoTrac, simply press the Auto Resume switch to engage automatic steering. AutoTrac Complete is a fully operational AutoTrac package ex-factory. NOTE: For more information on additional displays, receivers, and AMS products, refer to AMS product information. NOTE: To use AutoTrac, a GreenStar display and StarFire receiver is required. Compact tractor users often work in challenging environments, including in and around barns, fields, or livestock areas. Maneuverability is a priority as space can be limited at times. Implementing the single-piece mid-frame designs and the curved frame enabled the wheelbase of the 5R to shrink by 50 mm (3.9 in.) 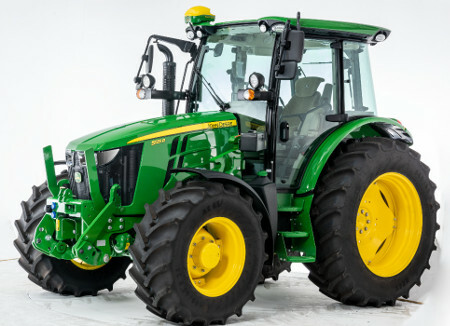 when compared to the Stage IIIB (Interim Tier 4 [iT4]) 5M Tractors. The shortened 2250-mm (88.5-in.) wheelbase provides best-in-class turning with a 7.5-m (24.6-ft) turning circle without the use of turning brakes. This calculation is based on using 340/85R24 (13.6R24) front tires, which provide 58 degrees of turning angle and a full 10 degrees of axle oscillation. The CommandQuad manual transmission expands the proven reliability of the PowrReverser™ transmission with a four-range, four-speed transmission that enhances operator convenience and productivity through fully electronic powered range and gear shifting. The CommandQuad manual uses the same robust final drives, rear axle, and differential as the already proven 5M PowrReverser transmissions. 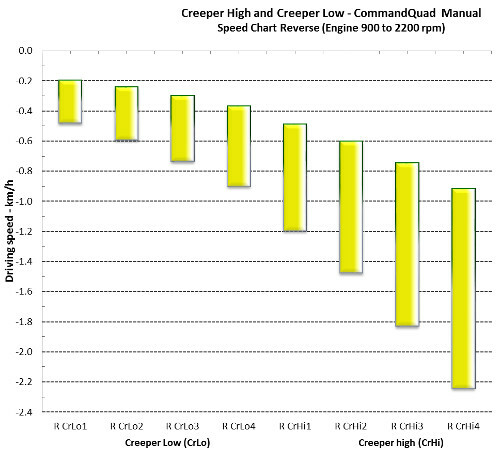 Rather than using mechanical synchronizers, the CommandQuad manual utilizes powershift clutches. Also, electrohydraulic cylinders move the range shift rails instead of a mechanical lever. This provides excellent ease of use and more efficient operation. 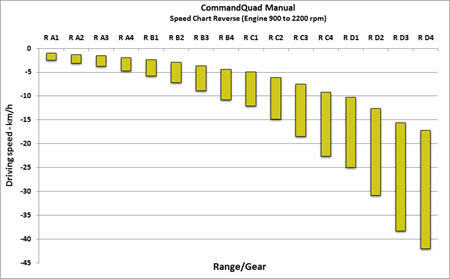 The CommandQuad manual transmission is equipped with 16 forward and 16 reverse (16F/16R) speeds, a left-hand reverser, and four powershiftable gears in four powered synchronized ranges. The CommandQuad manual transmission also comes with open-centered (OC) hydraulics in base equipment, with the ability to option up to pressure and flow compensating (PFC) hydraulics from the factory. The base CommandQuad manual transmission operates at speeds as slow as 1.9 km/h (1.18 mph) with rolling circumference index (RCI) group 44 rear tires, and speeds up to 40 km/h (25 mph). 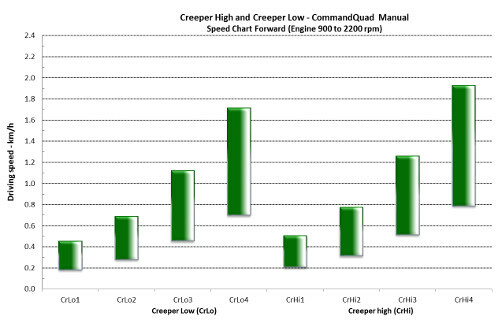 For even slower speed options, a creeper is available as a factory-installed option (requires PFC hydraulics). 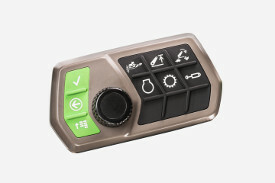 A single control lever, similar to the control used on the DirectDrive transmission on 6R and CommandQuad transmission on 7R, features an ergonomically designed and intuitive operator interface. 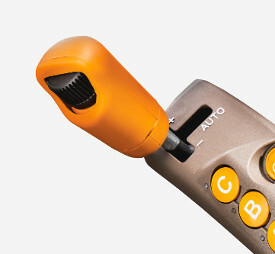 This control lever provides powered gear and range change selection. This base transmission, although similar in operation to the optional Command8™ transmission in terms of operation, does not offer any automatic shifting capabilities. Once the tractor is started, the operator selects a range by pressing one of the lettered range buttons on the right-hand console. The operator has five different selections to choose from - A, B, C, and two multi-range modes (BCD and CD). When a range with a single letter is selected, gear shifting is allowed within the specified range. When a range with multiple letters is selected, operators can shift between the designated ranges simply by using the bump lever. The gear within the range can be selected by using the transmission control bump lever to electronically shift to a desired gear. After setting the desired throttle position, the operator can move the left-hand reverser to the forward or reverse position to start movement. The operator can shift up or down through the gears in the selected range(s) as needed. The operator has the ability to shift through speeds and ranges without clutching by moving the bump lever forward, toward the + indicator, or backward, toward the - indicator. 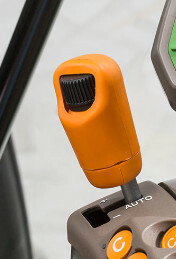 A single movement of the bump lever changes one gear at a time. Holding the bump lever in either direction selects consecutive gear changes throughout the range at a faster pace. When in a multi-range mode, a simple double bump of the lever moves to the next range up or down. The electronic left-hand reverser is standard with all CommandQuad manual transmissions and provides neutral-to-gear modulation, which allows a quick, convenient, and smooth forward-reverse shuttle shifting at any speed. 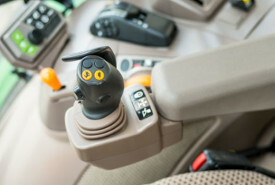 The shifter must be lifted from either park or neutral position to forward or reverse to activate. 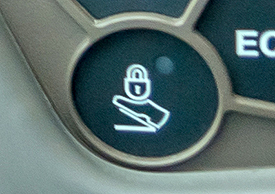 The parking lock is also electronically controlled through the left-hand reverser. The left-hand reverser is a great feature for loader tractors. The operator's left hand can control easily tractor direction while the right hand manages the loader joystick and speed changes. With AutoClutch, which is standard on all 5R Tractors, the operator no longer has to use the traditional clutch to stop or control tractor take off. The traditional clutch pedal is still on the tractor for those operators that still prefer to use it. AutoClutch provides the ultimate in ease of use to stop, start, and modulate tractor take off using only the brake pedal. AutoClutch allows the operator to bring the tractor to a complete stop without clutching, while at the same time does not overload the engine. It also provides the ability to inch or creep the tractor forward or reverse on a level surface or incline. And it provides the ability to accelerate the vehicle back to normal speed when releasing the brake. Low sensitivity would be typically used in transport applications with a towed implement. When shifting ranges in a multi-range mode (BCD, CD), the transmission will shift to a gear that most closely matches the speed in the range from which the operator is shifting from, which improves operator comfort by making a smoother transition into a new range. There are two types of speed matching, passive and active. With passive speed matching, when shifting to a new range, the tractor shifts to a selected fixed gear in the new range based on transmission ratios. For example, when shifting from C4 to D range, instead of shifting into D4 when the range is changed to D like a mechanically controlled transmission would do, the transmission shifts to a preset range and gear within range D. This most closely matches the transmission ratio from which the operator is coming from. 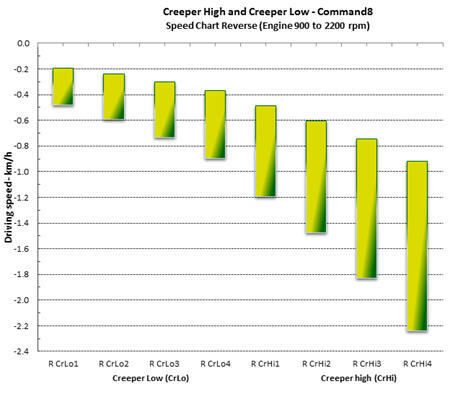 Active speed matching shifts up or down based on wheel speed during range shifts. This minimizes acceleration or deceleration when the clutch re-engages after a range shift and keeps a more consistent ground speed, improving operator comfort. 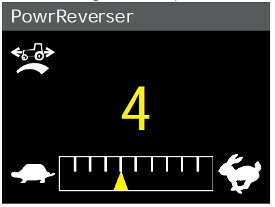 Similar to the 5M Tractors, which offer a PowrReverser modulation dial to set aggressiveness of change in direction, all 5R Tractors also offer PowrReverser modulation. Rather than a physical dial, the aggressiveness can be set through the cornerpost display. 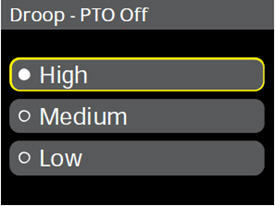 Settings can be set from 1 to 10, with 1 being the least aggressive direction change and 10 being the most aggressive direction change. A setting of 10 is popular for loader bucket applications where quicker directional changes are acceptable and more productivity is desired. Less aggressive modulation settings are ideal where smoother directional changes are required, such as bale stacking and pallet fork activities. Starting within gear 1 within every range has a negative impact on productivity. To minimize the amount of shifting required by the operator in many applications, start gears can be programmed by the operator when operating in any of the single or the two multi-range modes. In range CD, any start gear can be programmed into the cornerpost display between C1 and D1. 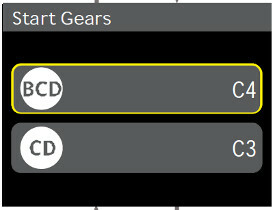 In range BCD, any start gear can be programmed between B1 and D1. Let’s say that an operator programs B4 as the start gear for BCD range. Anytime the operator selects BCD mode by pressing that particular range button, the tractor will automatically begin in gear B4. The operator can of course shift to any range and gear between B1 and D4 from there, but the starting point will be what the operator has programmed. This results in less shifting and more productivity. Within the fixed ranges (A, B, C), the operator can select a different starting gear in every range through the cornerpost display, the same as the multi-range button procedure. Similar to cruise control in a car, the foot pedal lock allows the operator to set a constant speed using the foot pedal. 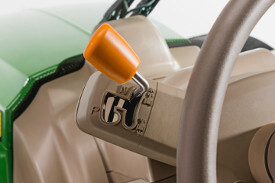 The switch to engage foot pedal lock is also located on the right-hand throttle control. To operate the feature, the hand throttle must be on the low throttle position. Use the foot control to increase the tractor to the desired travel speed, and then press the button to engage the foot pedal lock. When releasing the foot throttle, the tractor will then maintain the speed selected. It can be disengaged by either tapping the brakes, or moving the left hand reverser control to neutral or park. This feature is helpful in cyclical operations, such as loader work, where the operator wants to control the forward speed as a ratio of the reverse speed. In manual mode, the tractor automatically selects a gear closest to the ratio desired by the operator. In auto mode, the tractor would adjust the set speed in the opposite direction. Ratios can be programmed up to 100 percent faster than the forward speed or up to 80 percent slower than the forward speed within the cornerpost display. This is adjustable in 20 percent increments (forward speed x 0.20, 0.40, 0.60, 0.80, 1.00, 1.20, 1.40, 1.60, 1.80, 2.00). Another selection is independent; in this mode the tractor remembers the last forward and reverse gear setting. Once the gear is manually changed in the reverse direction, the gear will automatically go back to the last gear when changing directions. If the gear is not manually changed when in reverse direction, then the forward gear and reverse gear will remain the same when changing directions. While the maximum forward ground speed is 40 km/h (25 mph), the maximum reverse speed is 30 km/h (18.6 mph). The Command8 transmission expands the proven reliability of the PowrReverser™ transmission with a four-range, eight-speed transmission that enhances operator convenience and productivity through fully electronic range and gear shifting, as well as automatic shifting capabilities. The Command8 uses the same final drives, rear axle, and differential as the already proven 5M PowrReverser transmissions. 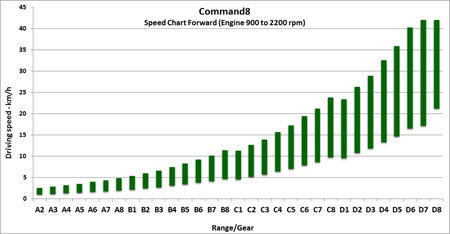 Rather than using mechanical synchronizers, the Command8 utilizes powershift clutches. Also, electrohydraulic cylinders move the range shift rails instead of a mechanical lever. This provides excellent ease of use and more efficient operation. The Command8 transmission is equipped with 32 forward and 16 reverse (32F/16R) speeds, a left-hand reverser, and eight powershiftable gears in four fully synchronized ranges. The Command8 transmission also comes with pressure and flow compensating (PFC) hydraulics in base equipment. The Command8 operates at speeds as slow as 1.9 km/h (1.18 mph) with rolling circumference index (RCI) group 44 rear tires, and speeds up to 40 km/h (25 mph). 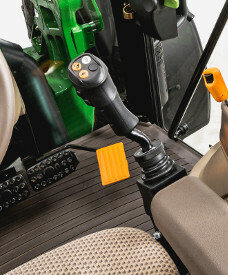 A single control lever, similar to the control used on the DirectDrive transmission on 6R and CommandQuad™ transmission on 7R, features an ergonomically designed and intuitive operator interface. 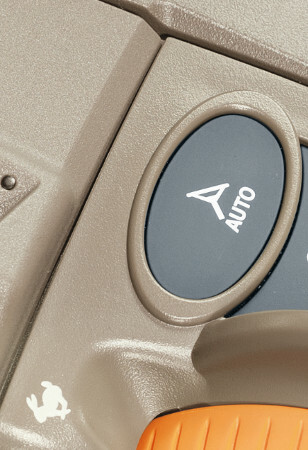 This control lever provides manual gear and range change selection when in the left position, and auto selection when shifted to the right position. The thumbwheel is used to dial in the desired ground speed in the auto position. Once the tractor is started, the operator selects a range by pressing one of the lettered range buttons on the right hand console. 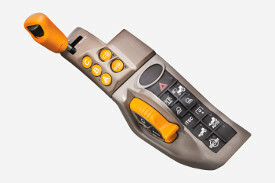 The operator has five different selections to choose from - A, B, C, and two multi-range modes (BCD and CD). When a range with a single letter is selected, gear shifting is allowed within the specified range. 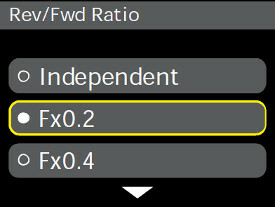 When a range with multiple letters is selected, operators can shift between the designated ranges simply by using the bump lever. The electronic left-hand reverser is standard with all Command8 transmissions and provides neutral-to-gear modulation, which allows a quick, convenient, and smooth forward-reverse shuttle shifting at any speed. The shifter must be lifted from either park or neutral position to forward or reverse to activate. The parking brake is also electronically controlled through the left-hand reverser. 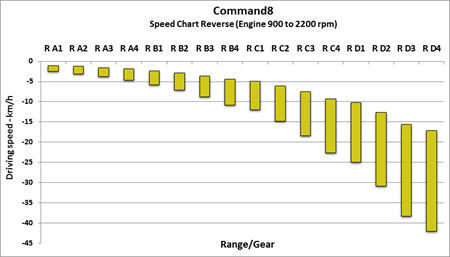 The Command8 features two different ways to operate transmission range and speed selections. In manual mode, the operator has the ability to shift through speeds and ranges without clutching by moving the bump lever forward, toward the + indicator, or backward, toward the - indicator. A single movement of the bump lever changes one gear at a time. Holding the bump lever in either direction increases accelerates gear changes throughout the range at a faster pace. When in a multi-range mode, a simple double bump of the lever moves to the next range. Depending on load, AUTO mode will optimize both the engine and transmission by selecting the appropriate gear and rpm to optimize fuel efficiency. The only input needed from the operator is to set the target ground speed by using the thumbwheel. Once that target speed is set by the operator, the tractor takes care of maintaining that speed. Once the operator has selected auto mode with the transmission shift lever, the following items will be displayed on the cornerpost display: auto activation, current ground speed, target ground speed, direction, range, and gear. 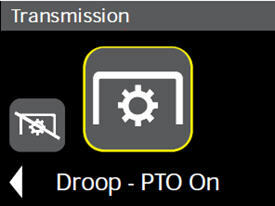 If the operator has selected AUTO mode with the transmission control lever, then the operator can set the shift points of the transmission through the cornerpost display. With AutoClutch, which is standard on all 5R Tractors, the operator no longer has to use the clutch to control braking and re-engagement of the tractor if so desired. The clutch pedal is still on the tractor for those operators that still prefer to manually foot clutch. This provides the ultimate in ease of use. Low sensitivity would be typically used in transport applications with a towed implement. The low sensitivity ensures that the tractor and implement are stretched for better traction control. With passive speed matching, when shifting to a new range, the tractor shifts to a selected fixed gear in the new range based on transmission ratios. For example, when shifting from C8 to D range, instead of shifting into D8 when the range is changed to D like a mechanically controlled transmission would do, the transmission shifts to a preset range and gear of D2. This most closely matches the transmission ratio from which the operator is coming from. Starting within gear 1 within every range has a negative impact on productivity. To minimize the amount of shifting required by the operator in many applications, start gears can be programmed by the operator when operating in any of the two multi-range modes. In range CD, any start gear can be programmed into the cornerpost display between C1 and D1. In range BCD, any start gear can be programmed between B1 and D1. Let’s say that an operator programs B8 as the start gear for BCD range. This means that anytime the operator selects BCD mode by pressing that particular range button, the tractor will automatically begin in gear B8. The operator can of course shift to any range and gear between B1 and D8 from there, but the starting point will be what the operator has programmed. This results in less shifting and more productivity. Within the fixed ranges (A, B, C), the preset start gears are A8, B8, and C4. These cannot be altered by the operator through the cornerpost display. Efficiency Manager is automatically enabled when the shift lever is placed in the automatic mode gate. The set speed adjuster on the top of the single lever gear selector allows the operator to dial in the desired ground speed to establish a set speed for forward and reverse. Efficiency Manager allows the transmission to up- or down-shift and change engine rpm to maintain the set wheel speed. To reach the desired set speed, the throttle must be set to full engine rpm. This allows Efficiency Manager to shift the transmission and adjust engine speed to maintain the desired wheel speed. In some applications an operator may want to manage parameters for shifting points and minimum engine rpm. This can be accomplished with settings within the cornerpost display via Eco mode. 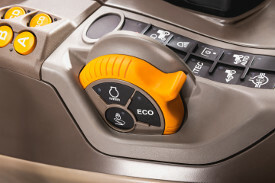 Eco mode can be turned off and on with a switch located on the hand throttle. In many cases, operators will choose to utilize Eco mode in lower load conditions, such as transport. 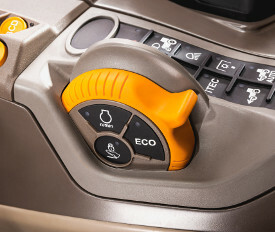 For tough field conditions, Eco mode is typically turned off. Minimum engine speed is adjustable between 900 and 2100 rpm. Eco mode allows the operator to program two minimum engine speeds: one for when Eco is turned off, and one for when Eco is turned on. When Eco mode is activated, the transmission and engine will shift up and throttle back in order to try to maintain ground speed at the low engine rpm selected by the operator. For example, if a grower chooses a target speed of 12 km/h (7.5 mph) at an engine speed of 1200 rpm, the transmission and engine will work together to shift to higher gears and throttle back to find a gear that is able to get close to the 1200 rpm target. When the grower gets to the field and wants to increase engine rpm to handle working tasks, simply turn Eco off with the Eco button on the throttle control, and the transmission and engine will then shift down and throttle up. The tractor will again target the speed selected via the thumbwheel, and the engine rpm that has been programmed into the cornerpost display for Eco off. This is an excellent way to maximize fuel efficiency on a 5R Utility Tractor. 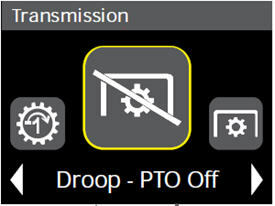 Load control droop allows the operator to control the shift point of the tractor. 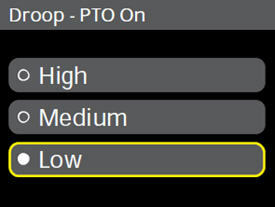 The goal of auto mode is to prevent the engine pulling down below this preselected operating point by downshifting automatically. It commands an upshift so that the engine speed is above the load control set point (droop) with sufficient torque reserve. It also commands a downshift when the engine speed is pulled down below the load control set point (droop). The load control droop can be set within the cornerpost display in two modes, PTO on and PTO off. 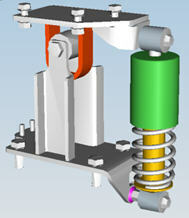 Selecting high droop minimizes shifting, while selecting low droop provides faster reaction to load. 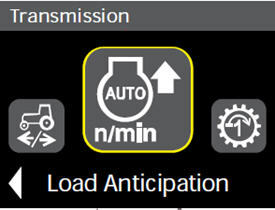 A load anticipation feature is standard equipment on all tractors equipped with a Command8 transmission. Its primary function is to increase productivity and provide more operator comfort by assisting the operator to handle expected high-load situations by automatically increasing the fuel economy optimal engine speed when working with implements. It can be used in both PTO and hitch activities, and can be turned on or off for each within the cornerpost display. The load anticipation feature also activates when using PTO or hitch functions programmed within iTEC™ Basic system sequences. Featuring a single-piece front windshield, forward facing visibility has improved by 7 percent for easier loader attachment hookups and easier following of rows in vegetable and other row-crop applications. Upward visibility has improved 80 percent with the new panorama roof cab, providing for easier bale stacking, pallet stacking, and dumping loads into walled trailers. For improved ease of use and visibility in both sunny and adverse weather conditions, the panorama roof cab comes standard with several tools to help get the job done. To shield the operator from the sun on bright days, an easy-to-use sliding overhead sunshade with an integrated front pull-down shade is provided. Standard factory-installed, the cab also offers an auxiliary and a USB port to connect custom electronic devices and a Bluetooth® microphone, operators are able to connect those to any compatible radio. 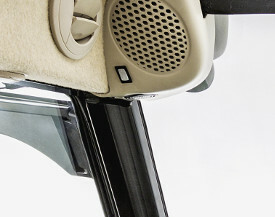 Integrated into the front speaker is an additional interior light in the bottom of the left-corner-mounted speaker. Controlling speed on the 5R Tractor in loader applications has never been easier. 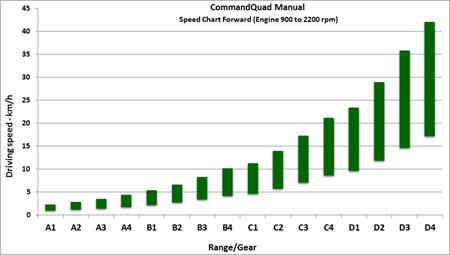 Whether the grower selects the CommandQuad™ manual, CommandQuad, or Command8™ transmission, gear shifting is included as base equipment on any 5R Tractor that is equipped with mid selective control valves (SCVs). These joysticks are mounted to the seat. Since all 5Rs come standard with swivel seats, anytime the operator swivels the seat, the joystick also moves with it. This design improves comfort and operational efficiency by always having the loader controls at the operator's fingertips. There are two types of loader joysticks available, mechanical and electrohydraulic. The mechanical loader joystick is mounted to the seat base, and is available with either open center or pressure and flow compensated (PFC) hydraulics. The boom movement and implement rollback are controlled via cables from the loader joystick, which actuate the mid SCVs. If equipped with a third SCV for grapple functions, electronic buttons on the joystick control the opening and closing of the grapple. On top of the loader joystick are buttons for gear increase and decrease. By pressing the button for the gear movement to be executed, either increase or decrease, the tractor will correspondingly shift the tractor by one gear. If the operator presses and holds the button, the tractor will more quickly accelerate through the gears. And if operating in a multi-range mode (CD or BCD), pressing the button twice will change to the next range. It is almost like having a duplicate of the transmission bump lever integrated right into a loader joystick. 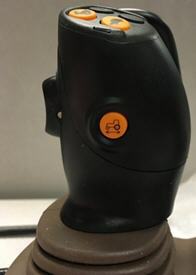 The mechanical joystick can be easily locked out with a simple twist when the loader is not in use. Loader suspension can also be turned on and off on the face of the joystick with a switch. The electrohydraulic joystick is very similar to the mechanical joystick, but with a few key differences. This joystick also swivels with the seat, but is mounted at the end of the armrest or on the CommandARM™ console rather than the seat base. Instead of cable control of the SCVs, it is fully electronic. The lockout is controlled electronically rather than with a mechanical lock. It is also available only with PFC hydraulics. 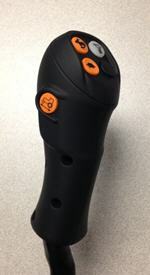 The functionality is very similar to that of the mechanical joystick. Either joystick option makes loader operation extremely comfortable on those long days of moving hay bales, stacking pallets, or general loader work. Controlling direction on the 5R Tractor in loader applications has never been easier. Whether the grower selects the CommandQuad manual, CommandQuad, or Command8 transmission, an integrated reverser is included as base equipment on any 5R Tractor that is equipped with mid SCVs. The two types of loader joysticks available, mechanical and electrohydraulic, are equipped in based with the reverser functionality. On the side of the loader joystick is a button for reverser function. By pressing the button, the tractor will change the selected direction. This reverser feature on joystick makes loader operation extremely comfortable on those long days of moving hay bales, stacking pallets, or general loader work. Comfort is optimal, and the left hand can stay on the steering wheel whatever it position. With AutoClutch, which is standard on all 5R Tractors, the operator no longer has to use the clutch to control braking and re-engagement of the tractor if so desired. The clutch pedal is still on the tractor for those operators that still prefer to manually foot clutch. This provides the ultimate in ease of use, especially in applications where precise control and more stopping /starting is required. AutoClutch allows the operator to bring the tractor to a complete stop without clutching, while at the same time does not overload the engine. It also provides the ability to inch or creep the tractor forward or reverse on a level surface or incline. 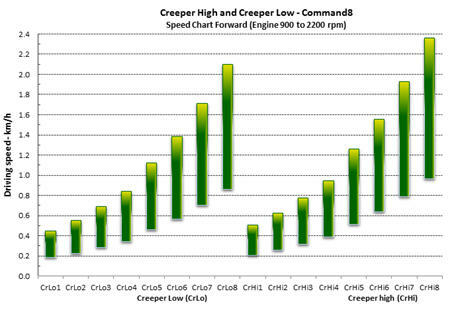 Being able to inch or creep the tractor is an important tool for more efficient front and rear implement hookups. AutoClutch also provides the ability to accelerate the vehicle back to normal speed when releasing the brake. John Deere uses the most efficient and cost-effective solution for the tractor package to meet emissions requirements at each horsepower level. The 5R delivers best-in-class diesel efficiency requiring no refueling at 75 percent load for an 8-hour work day. This advantage can be prolonged by using AUTO mode, operating in stationary power take-off (PTO) applications and through the oil cooler bypass technology. The engine powering the 5R is Stage IIIB (iT4) certified. This is achieved through a combination of a diesel oxidation catalyst (DOC) and diesel particle filter (DPF). John Deere has chosen to utilize a DOC to reduce carbon monoxide, hydrocarbons, and some particulate matter. The engine is programmed to aggressively respond to changes in power needs, which can temporarily increase particulate matter. Since the DOC removes particulate matter instead of the engine, the engine is left free to do what it is designed to do – deliver all of the power, torque, plus transient response needed. The DPF is constructed of ceramic porous channel walls, trapping, and holding any remaining particulate matter. Once one of the three parameters has been met, filter cleaning occurs. Requires no operator involvement and no interruption to tractor operation. If conditions (temperature, load, or speed) for passive filter cleaning cannot be achieved, then particulate matter is removed using active filter cleaning. To achieve the required conditions, exhaust temperature management (ETM) manages the initiation and duration of active filter cleaning. An icon on the dash console indicates when ETM and active filter cleaning have been initiated. ETM can adjust numerous engine parameters and/or inject a small quantity of fuel into the exhaust stream for a short duration. The fuel turns to vapor and chemically reacts with the catalysts in the DOC to create heat to oxidize particulate matter. In some rare instances, a parked filter cleaning may need to take place. Most likely the only time a parked filter cleaning needs to occur is when automatic filter cleaning has been disabled for an extended period of time, and multiple warnings to engage filter cleaning were ignored. Additionally, when the automatic filter cleaning process has been deliberately interrupted multiple times, or if active filter cleaning has failed numerous times due to a failed component, a parked filter cleaning may be requested. 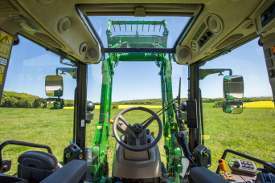 NOTE: Disable mode should only be used when temporarily connected to an indoor ducted exhaust system for diagnostic and repair activities, or when the tractor is used in confined spaces where high exhaust temperatures are not desired. Exhaust gases contain more carbon dioxide than oxygen. The EGR valve, in conjunction with the venturi tube, and engine control unit (ECU), allow a controlled amount of exhaust gas to enter the intake manifold to mix with the incoming fresh air. Exhaust airflow enters into the EGR cooler from the exhaust manifold near the turbocharger. Based on engine load, air temperatures, and rpm, the ECU opens or closes the EGR valve, allowing a measured percentage of exhaust gas to enter the intake manifold. The gases mix with the rest of the incoming air from the turbocharger and aftercooler before entering the cylinders. 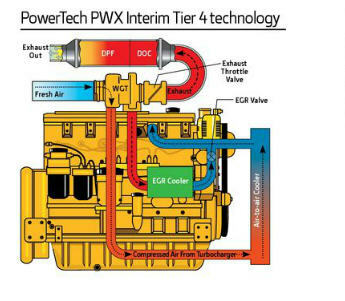 The PowerTech PWX 4.5L engine utilizes one turbocharger — a fixed geometry, wastegate turbocharger. Fresh air is first drawn into the low-pressure fixed geometry, wastegate turbocharger, and compressed to a higher pressure. The compressed air is then routed to the charge air cooler and then to the intake manifold. A restrained, cooler combustion is realized, since the typical hot combustion process, which is generated by an oxygen surplus, is dampened by the inert exhaust gases. Hence, NOx emissions are reduced. 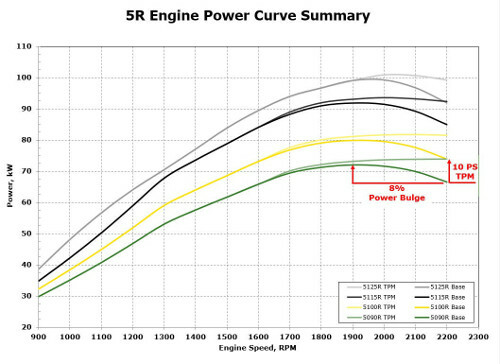 5R Stage IIIB (Interim Tier 4 [iT4]) engines feature up to an 8 percent power bulge when put under load. The power bulge feature of the electronically controlled engine delivers additional horsepower as engine rpm drops below rated speed. Additionally, a 36 percent torque rise provides the force that maintains horsepower as engine rpm drops below rated speed. When the tractor is under load, power bulge and torque rise work together to get through the tough spots and reduce the need to downshift. Horsepower and torque are mathematically related. The peak torque rise also occurs near the rated economy power take-off (EPTO) speed for enhanced performance when operating in 540E power take-off (PTO). When a tractor is running at idle in park for about more than 1 minute and no features are actuated (PTO, hydraulics, etc. 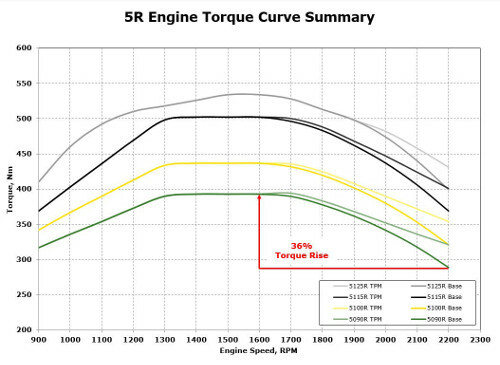 ), the engine will automatically reduce the engine rpm to about 650 rpm. The digital cornerpost display features state-of-the-art electronic instrumentation and blends well with the narrow right-hand cab post. This intuitive design eliminates the instrument cluster once surrounding the steering column while increasing forward facing visibility. 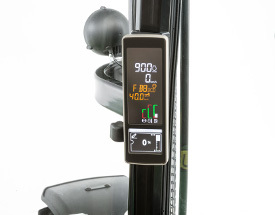 In addition to displaying machine information, the cornerpost display also serves as the primary interface between the tractor and operator when adjusting hitch, transmission, hydraulic, and engine settings. Interaction with the cornerpost display is primarily controlled with a button module mounted at the front of the right-hand upholstery. On the left side in green are a check mark button used to select items, a left arrow button that serves as a back button, and a menu button. The black wheel in the center is used for toggling within screens or adjusting settings. To the right of the scroll wheel are hot buttons for frequently controlled settings, including draft control, hitch raise height, hitch drop rate, engine settings, transmission settings, and hydraulic settings. These buttons serve as shortcuts to make adjusting more common settings quicker and easier to access. For operators wanting superior comfort and smoother driving, mechanical cab suspension is available for the 5R Series Tractors. The mechanical cab suspension reduces operator fatigue and improves comfort, especially when operating long hours in uneven fields. The system provides stability to monitors in the cab helping to keep them in your viewing area. While offering a smoother ride, this factory-installed option also reduces noise and vibrations inside the cab from the engine, transmission, chassis, and implements one may be operating. The cab rests on two rubber isolators at the front and two fully integrated shock absorbers at the rear which dampen the vibrations coming through the frame.